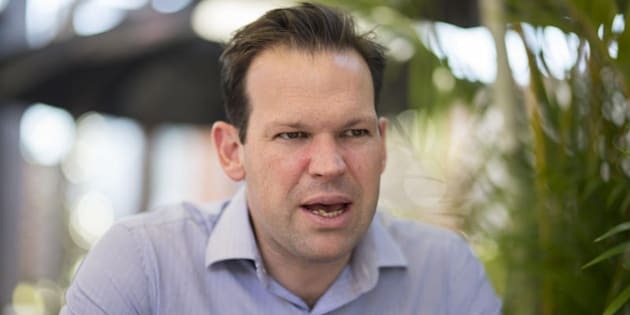 Now Matt Canavan's political career is in doubt. Matt Canavan: "Until last week, I had no suspicion that I could possibly be an Italian citizen". CANBERRA -- Matt Canavan has blamed his mum for his current dramas, which is a big Italian no-no. Now it appears the Nationals senator did actively discuss with his family whether they should pursue the dual citizenship that has landed him in trouble, and out of the Turnbull Cabinet. But Canavan, according to his loyal boss Barnaby Joyce, did not want dual Italian citizenship when it was brought up in his family in 2005. And that is where he thought it ended. Greens Leader Richard Di Natale on Canavan: "If you're a real Italian, you never blame your mother for anything. " It's usually a complicated, active process to get Italian citizenship, but Deputy Prime Minister Joyce has told reporters in Canberra, Canavan never signed the papers. "Senator Canavan has stated to me that he did not complete any forms, so it was a discussion the family had and he thought that's where it's rested," the Nationals Leader said. "I think they've found the forms and they're unsigned. "From what has been conveyed to me, he had no interest in becoming an Italian citizen." However, a year later his mother applied for that citizenship that has got him in hot water. "No doubt, it's an incredibly difficult time for his mother," Joyce said. "She would be, she would be at wits' end thinking of the chain of events that have occurred." The Deputy Prime Minister revealed he first heard about Canavan's troubles last week on the 18th. Not long after Larissa Waters became the second Greens senator -- after Scott Ludlam -- to resign over her own dual citizenship with Canada. But the senator only went public late on Tuesday when media outlets became aware of his predicament. Greens Leader Richard Di Natale said on Wednesday that Canavan should follow the Greens and resign. "The advice we received was that ignorance is no excuse," Di Natale said. "If you're a genuine Italian, you're a real Italian, you never blame your mum for anything ... so that might be his only defence in this case, I reckon." Considered a Turnbull Government rising star, Canavan resigned from his Cabinet position as Resources and Northern Australia minister but has decided to stay in the Senate until the High Court makes a decision on his status. The Senator and his colleagues hope the drama is temporary and appear to be fighting the alleged Constitutional breach over the claim that he was not aware of his mother's actions. "I was not born in Italy, I've never been to Italy and, to my knowledge, have never stepped foot in an Italian consulate or embassy," Canavan said on Tuesday. "Until last week, I had no suspicion that I could possibly be an Italian citizen. "While I knew that my mother had become an Italian citizen, I had no knowledge that I myself had become an Italian citizen, nor had I requested to become an Italian citizen." It happened around the same time as Canavan's father, Michael Canavan, was convicted of significant workplace fraud, but Joyce does not think there is a connection. "No. I don't think so. And, um, I don't particularly want to go into the details of that," he said. "I've never heard him make one excuse for any of those events that you just occurred and, of course, when he went into politics, we discussed that and he's never said anything but exactly what he's doing now. This guy is so straight down the line. He's always said, 'If people break the law, they pay the price'." Canavan is being backed by Joyce, who has described him as an "incredibly competent politician", a "decent human being" and a "huge asset for our nation". "It was without a shadow of a doubt that we never believed that this would be the chain of events, because this has happened without his consent," Joyce told reporters. "And he was 25 years old at the time. And without his knowledge. He never signed a form. And, of course, one would presume that if something happens without your knowledge, and without your consent, then it's probably an invalid process." "I'll just use the PM's own words and say it'd be incredible sloppiness." Richard Di Natale responds to Matt Canavan citizenship doubts. Constitutional law experts, like Professor George Williams, believes the High Court could go either way on Canavan's case, as there are no clear precedents. Joyce hopes the High Court deals with the matter speedily. "The Constitution is what the Constitution is and it is written in black and white and it has to be complied with," he said. Joyce is talking over Canavan's portfolios and is expected to be sworn in by the Governor-General tomorrow.